Portable ticket office made from 20ft shipping container. This shipping container ticket office conversion gives you mobility, and much more. When an international events company needed a portable ticket office that could be shipped around the world, they turned to the idea of using a converted shipping container. Arrow design feature meant both adults and kids could easily be served, whatever their height. An arrow shaped window was cut into the side walls, this shape allowed adults to be served at normal height, whilst children could be attended to at a more suitable level. When opened the arrow also had the advantage of pointing people the right way towards the event. 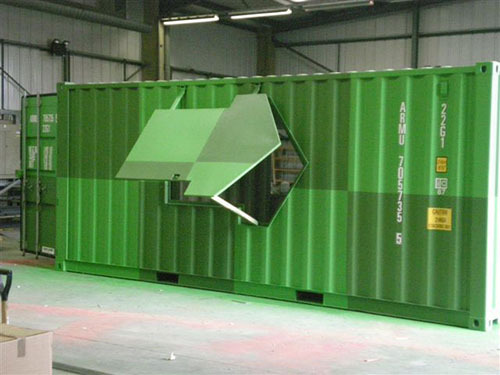 Using a shipping container you get a mobile ticket office and secure storage unit, all in one. Whilst you’re not using the container to sell tickets you can use it for secure storage, and moving it within the same country is easy – you just load it on the back of a truck. But what if you need to move the container internationally? Before a container can be shipped overseas it must have a valid Safety Convention plate, also known as CSC plate. However, in the case of this conversion the removal of a large section of the container side wall made the original shipping certificate invalid. So once the conversion work was complete an engineering assessment was carried out. This assessment resulted in reinstatement of the CSC approval and meant that the box could transported anywhere globally. What’s really great about this container ticket office conversion is that you can transport your cargo to the event destination country at the same time. This means it’s a dual purpose product that’s perfect for selling selling tickets and getting your stuff where it needs to go.